Employees who spend time working alone in the community are being offered advice on staying safe at an event being held in Lancaster next month. The event is aimed at healthcare professionals, care workers, estate agents, legal and finance professionals and others who may spend time working alone, such as visiting customers’ homes. 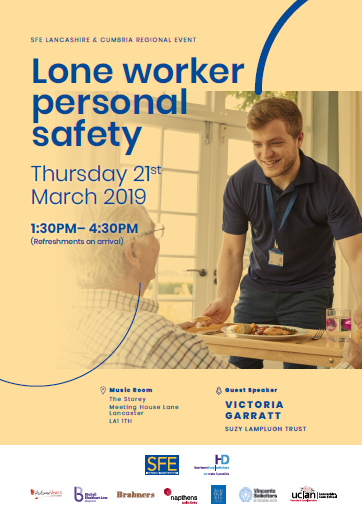 The ‘Protecting Lone and Frontline Workers’ event is being hosted by the Lancashire and Cumbria group of Solicitors for Elderly (SFE) and takes place at The Storey on Thursday, March 21 from 1:30pm. It will feature expert guest speaker Victoria Garratt from the Suzy Lamplugh Trust – the personal safety charity established in the wake of estate agent Suzy’s disappearance in 1986. Regional co-ordinator and law lecturer for UCLan, Jane Huntley, said: “Many of our members are lone workers, out and about seeing clients in their own home or at hospital appointments. 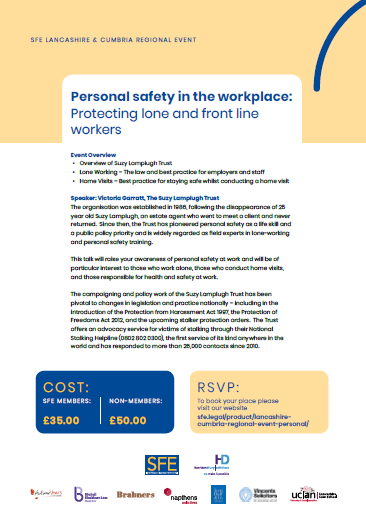 This event will be of interest to those wanting to increase their confidence in their own personal safety both in and out of the office. The Lancashire and Cumbria SFE regional group relaunched last year and is now supported by an active committee made up of solicitors and legal executives from Autumn Years Law, Birchall Blackburn Law, Brabners, Harrison Drury, Napthens, and Scott Duff and Co, as well as the Lancashire Law School at the University of Central Lancashire. SFE is an independent, national organisation of over 1,600 solicitors, barristers and chartered legal executives who provide legal advice to older and vulnerable people. Members are regulated by their respective professional bodies, and must meet strict membership criteria to join. The Suzy Lamplugh Trust was established in 1986 following the disappearance of 25-year-old Suzy Lamplugh, an estate agent who went to meet a client and never returned. Since then, the trust has pioneered personal safety as a life skill and a public policy priority and is widely regarded as field experts in lone-working and personal safety training. The trust also offers an advocacy service for victims of stalking through their National Stalking Helpline (0808 802 0300), the first service of its kind anywhere in the world and has responded to more than 26,000 contacts since 2010. Full details of the event are available on the Solicitors for the Elderly website.